For months — no! Years! — I have been writing about testing, more specifically automated testing. I have shared my Site Infrastructure Tests github, I have spoken about it at the Adobe Summit in London, and I have mentioned multiple times that all of this should be integrated with the workflow of the developers, your workflow. But I have never explained how to do that! Worse: I have no idea how to do that! I am not a developer (well, I used to be a C developer, in the days of Palm OS, but does that count? Not anymore, for sure), and I frankly don’t know what the current state of the art for testing is. I have therefore chosen to ignore this glaring hole, like a lousy trickster. Today, I’ll show you how to take a Raspberry Pi, install Jenkins on it and automate your tests. That should add a considerable amount of protection against accidentally breaking any tracking, or at least it should detect breakage very quickly! Feel free to build two, and put one on your friendly marketer’s desk, too. And if we’re really lucky, you are using Jenkins anyway, so this little project neatly maps into your workflow. I’m not going to go into all the steps needed to setup your Raspberry Pi. The guide on the NOOBS page should get you going. Choose “Raspbian” as the operating system. Make sure you set the timezone correctly! If the time on your Raspberry Pi is too far off, you’ll be unable to install packages over HTTPS. Been there, pulled my hair over that, felt foolish once I found out. Once you have a working Raspberry Pi with Raspbian, and you have successfully logged into it, you’re ready to go. You’re going to need some things on the Pi — Java, phantomJS, Chromium, ChromeDriver, Maven — the same things we needed on Windows and Mac, obviously. On top of that, you will install Jenkins. Since this is Raspbian, which is a fork of debian, which is Linux, we’ll handle this via command line. Go ahead, open up a terminal. You’ll notice that quite a bunch of dependencies are installed along with Maven. I’ll be totally honest with you: there is actually no need to install Maven at this point, as we will later configure Jenkins to install a version. But I’d do it anyway so I can run tests on the command line. Now let’s find phantomJS somewhere. It is unfortunately not available in the normal Raspbian repository, but you can grab it from this github. Note that the proper way would have been to compile phantomJS from sources. I tried that once on a Raspberry Pi 2, despite warnings it would take days. I ended up downloading a binary, when I ran into missing dependencies issues and other hiccups. I am fully aware that downloading binaries from sites I don’t trust is a bad idea. If you have a linux / dev person that could help you build phantomJS, please do so! Ok. Let’s pause for a moment and make sure you’re on the right track. With the right JDK and all other things in place, you can install Jenkins. sudo /bin/su -c "echo 'deb https://pkg.jenkins.io/debian binary/' > /etc/apt/sources.list.d/jenkins.list"
Note: If apt tries to install jenkins 1.x, double-check the time on your Raspberry Pi. Yes, you read that right. It should install jenkins 2.x, really, but the jenkins.io repository is accessed via HTTPS, which doesn’t work if the time on your Pi is off too much. Happened to me. 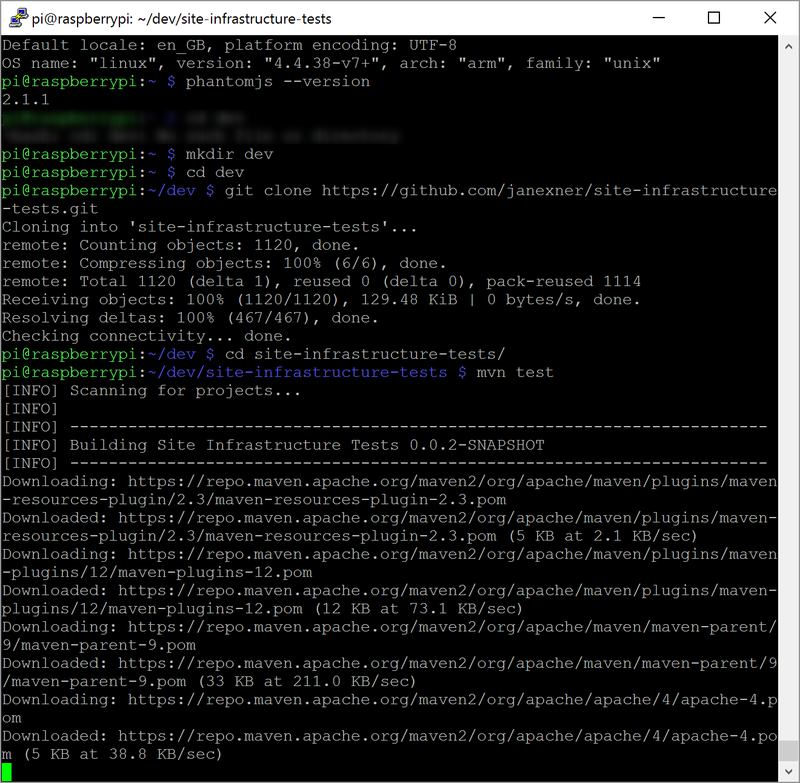 After downloading a whopping 70M of packages, apt will install Jenkins and a service. Reboot your Pi, so the service can start. Give your Raspberry Pi some time, it’ll need it. You now have a Jenkins continuous integration server. It wants to be configured. The very first step is to unlock Jenkins. will show you the password, which you can then c&p into your browser. 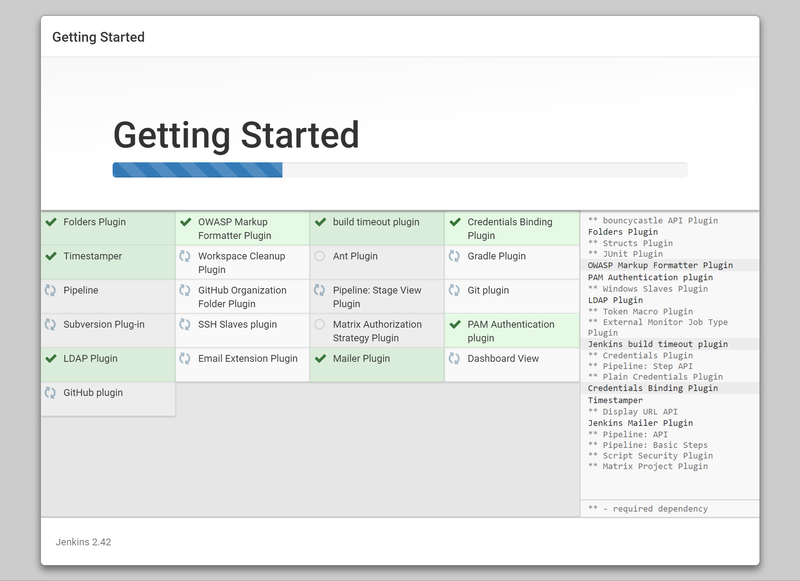 Next, it is time to customize Jenkins by adding plugins. Go for the “Select” option, and make sure you select at least “Dashboard View” and “Github Plug-in”. Click “Install”. Jenkins works a little bit, then gives you an empty dashboard. 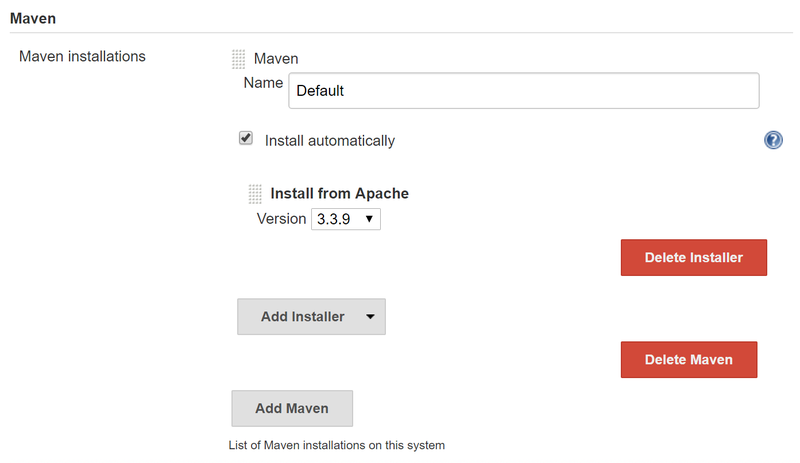 Now, tell Jenkins to install Maven as a tool. 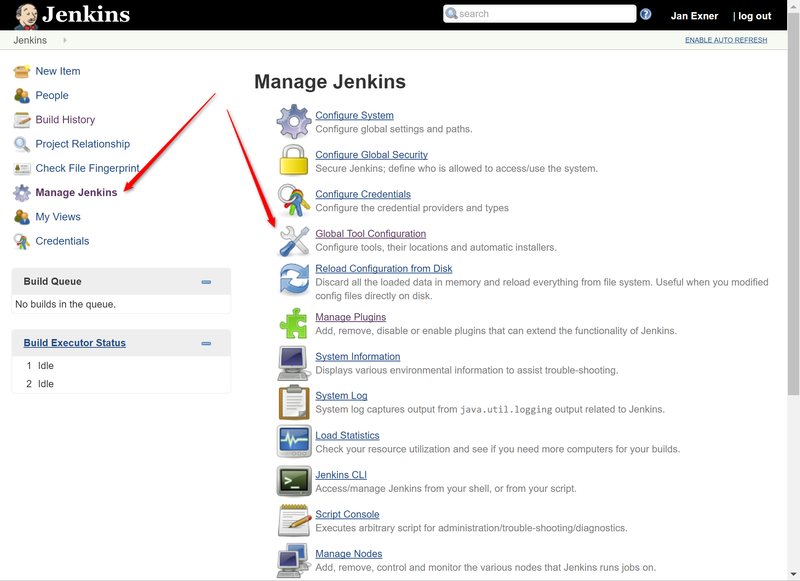 Click the “Manage Jenkins” link in the menu on the left, then “Global Tool Configuration” from the list. You are now ready to create a job. That job will later be responsible for running our regular test. So exciting! Give it a name, select “Maven Project”, then click the little “Ok” button that floats around in the lower left. the source of the code — where does it come from? the build triggers — when should it test? The former is in cron format. Unix/Linux-based systems have had this since the 70ties. Don’t want to go into details, but “H H * * 7” essentially means “at some time every Sunday”. The latter, the “Goals and options” field, contains the exact same command line options that you would usually put right after the mvn command. The example in the screenshot tells Maven to run a clean, then a test and pass the -Dtest.description.file=tests.webade.json (and -Dwebdriver.chrome.driver=/usr/local/bin/chromedriver, TBD) parameters into the testing tool. Note that you can easily run multiple, different tests on your Raspberry Pi by creating multiple jobs. The only difference between them will likely be the “Goals and options” field, pointing to different test description JSON files. From now on, the job will run every Sunday, as long as the Pi is powered on. You can run the job from the Dashboard manually at any time. Jobs can be successful, or they can fail. The Jenkins website explains what those “Job Status” and “Build Status” icons mean. The “W” column depicts the overall situation, the weather. All my jobs look pretty sunny. If a job works, you’re happy, and there is nothing to do, really. If it fails, you’ll want to know why. My suggestion is to use the “Console Output” to diagnose the issue behind the failure. You get there via the job number (“#12” above). The output you’ll see is exactly the same as the output you’d get if you run Maven manually. You can see which test(s) failed, and act accordingly. This will likely include a meeting with your friendly marketer! Firstly, you should test your own site, build a JSON test description file for all the things on your site that are valuable for your friendly marketer. The easiest way to do so would be to put your JSON file into a folder somewhere on your Raspberry Pi and refer to it in the test setup. The good way of doing it would be to fork my github project, add the new JSON file to your own fork, then use that fork in the test setup. That way you automatically get version control for your test descriptions, which is definitely a good thing! You can even create different branches in your git, and test against those! Do not forget that software grows old much faster than humans! If the updates include the kernel, you should reboot your Pi at that point, but otherwise there is no need. Just keep it running. Feel free to comment. Does this work for you? Do you test differently? I want to hear what people do to keep data quality up! Did the whole setup, was pretty easy, but my former me was also a sysadmin. The setup could be filled in a bash script t make it more easy. And jenkins is kind of overhead, tests could also be configured via bash with maven and phantomjs (but you did write this down). The real work will be writing the test description. There is a reason why I used Jenkins. It is overhead on the Raspberry Pi, but chances are the dev team use it, meaning you can use the Pi to work on your test descriptions, then have dev use them in their actual test framework. I made a script to install all the parts. the only difference is, it works for Rasbian and not Noobs. I did this, because Raspbian is a lot smaller and don’t has overhead. I guess since we have phantomJS, the setup of Jenkins could possibly be automated, no? I’ll look into that.